First American space walk. First American long-duration spaceflight. Astronaut could barely get back into capsule after spacewalk. Failure of spacecraft computer resulted in high-G ballistic re-entry. AKA: American Eagle / Little Eva. Launched: 1965-06-03. Returned: 1965-06-07. Number crew: 2 . Duration: 4.08 days. Location: National Air and Space Museum (Smithsonian Institution), Washington, DC. Major objectives of the four-day mission were demonstrating and evaluating the performance of spacecraft systems in a long-duration flight and evaluating effects on the crew of prolonged exposure to the space environment. Secondary objectives included demonstrating extravehicular activity (EVA) in space, conducting stationkeeping and rendezvous maneuvers with the second stage of the launch vehicle, performing significant in-plane and out-of-plane maneuvers, demonstrating the ability of the orbit attitude and maneuver system (OAMS) to back up the retrorockets, and executing 11 experiments. The stationkeeping exercise was terminated at the end of the first revolution because most of the OAMS propellant allocated for the exercise had been used; further efforts would jeopardize primary mission objectives and could mean the cancellation of several secondary objectives. No rendezvous was attempted. The only other major problem to mar the mission was the inadvertent alteration of the computer memory during the 48th revolution in an attempt to correct an apparent malfunction. This made the planned computer-controlled reentry impossible and required an open-loop ballistic reentry. All other mission objectives were met. The flight crew began preparing for EVA immediately after terminating the stationkeeping exercise. Although preparations went smoothly, McDivitt decided to delay EVA for one revolution, both because of the high level of activity required and because deletion of the rendezvous attempt reduced the tightness of the schedule. Ground control approved the decision. The spacecraft hatch was opened at 4 hours 18 minutes into the flight and White exited 12 minutes later, using a hand-held maneuvering gun. White reentered the spacecraft 20 minutes after leaving it. The hatch was closed at 4 hours 54 minutes ground elapsed time. Drifting flight was maintained for the next two and one-half days to conserve propellant. The spacecraft landed in the Atlantic Ocean about 725 km east of Cape Kennedy - some 65 km from its nominal landing point. The crew boarded a helicopter 34 minutes after landing and was transported to the prime recovery ship, the aircraft carrier Wasp. Spacecraft recovery was completed at 2:28 p.m., a little more than 100 hours after Gemini 4 had been launched. Gemini 4 was the first mission to be controlled from the mission control center in Houston. About 12 hours before Gemini IV's scheduled liftoff on 3 June 1965, the Martin crew started fueling the booster and calibrating its propellant loads. Borman and Lovell, the backup crew, flipped spacecraft switches, tested communications circuits, and handled other chores to relieve the prime crew. McDivitt and White had gone to bed at 8:30 the night before. Awakened at 4:10 a.m., they were given a brief physical examination. The astronauts left their Merritt Island quarters after breakfast and boarded a van for the ride to the pad 16 suit-up area, where they were helped into their suits while breathing pure oxygen to get the nitrogen out of their systems and thus prevent aeroembolism, or the bends. McDivitt and White arrived at pad 19 at 7:07 a.m., rode up in the elevator, and climbed into their spacecraft at T-100 minutes. Getting in was relatively easy, but even so White's faceplate fogged. He started his suit fan and cleared up the moisture. Thirty-five minutes before the scheduled launch, while the erector was being lowered, it stuck at a 12-degree angle from the booster. Raised to its full height, then lowered again, the erector still stuck. After more than an hour, technicians found a connector incorrectly installed in a junction box, replaced it properly, and gave the signal to lower the erector. This time it worked. Space travel was becoming operational. This hold, lasting 1 hour 16 minutes was the only delay for Gemini IV. On Mercury-Redstone 4, the second manned launch in that program, Grissom's Liberty Bell 7 was scrubbed twice and was plagued by six holds that totaled 4 hours 1 minute. At 10:16 a.m., Thursday, 3 June 1965, millions of people throughout the world looked and listened while Gemini IV lunged spaceward. Television coverage of the launch for the first time had an international audience, as the scene was broadcast to 12 European nations via Early Bird satellite. Heightened by the prospect of EVA and the first use of the new Mission Control Center in Houston, interest in Gemini IV reached levels never again matched in the program. The Manned Spacecraft Center faced a major challenge in the number of reporters who wanted to cover the story from Houston. Although MSC's Building 1 auditorium had been "designed to house all large events covered by the news and television services," its 800 seats fell short of the space that would be needed to accommodate the 1,100 requests for accreditation NASA had received. To meet the demand, MSC leased one of the new buildings springing tip across the highway from the Center for local offices of aerospace companies - and that move came under fire from the local press when its cost was revealed: besides the $96,165 year rent, MSC spent $166,000 for modifications, $8,000 for television monitors, and $6,600 for 610 chairs. But "Building 6," housing the NASA Gemini News Center, served its purpose well as the base for 1068 newspaper, magazine, radio, and television representatives, as well as 60 public relations people from industry. It opened on 25 May, somewhat earlier than the "launch minus five days" that had been customary for news centers during Mercury. In the spacecraft, McDivitt and White had no doubts about liftoff, as they felt their vehicle pick up speed. There was very little noise. The hush was broken only when the launch vehicle bounced like a pogo stick for a few seconds. Then everything smoothed into near silence again. Pyrotechnic shattered the illusion of quiet at stage 1 and, later, at stage 2 separation. The spacecraft entered an elliptical orbit of 163 kilometers at the low point (perigee) and 282 kilometers at the high point (apogee). As Gemini IV separated from its booster, McDivitt turned the spacecraft around to look for the trailing vehicle. White saw the rocket venting, with propellant streaming from its nozzle. How far was it, and where was it going? McDivitt estimated the distance as 120 meters; White guessed it was closer to 75 meters. McDivitt braked the spacecraft, aimed it, and thrusted toward the target. After two bursts from his thrusters, the booster seemed to move away and downward. A few minutes later, McDivitt pitched the spacecraft nose down and the crew again saw the rocket, which seemed to be traveling on a different track. He thrusted toward it - no success - and stopped. McDivitt repeated this sequence several times with the same luck. As night approached McDivitt spotted the booster's flashing lights. He estimated that the distance to the target had stretched to perhaps 600 meters. He knew he had to catch the booster quickly if they were going to stationkeep and do extravehicular activity as planned. For a while, Gemini IV seemed to hold its own and even to close with the other vehicle. McDivitt thought they got to within 60 meters, but White estimated it at 260 to 300 meters. The target's running lights soon grew dim in the gray streaks of dawn and vanished with the sunrise. When the target hove into view about three to five kilometers away, McDivitt again tried to close the distance. Additional thrusting did not seem to bring it any closer. Well aware that he was a pioneer in orbital rendezvous and that choosing the right maneuvers might not be as easy as it seemed, McDivitt had previously asked Mission Director Kraft which was more important, rendezvous or EVA. The space walk, said Kraft. McDivitt knew he had to stop spending fuel chasing the elusive target by the "eyeball" method. As GPO engineer Andr� Meyer later remarked, "There is a good explanation for what went wrong with rendezvous." The crew, like everyone else at MSC, "just didn't understand or reason out the orbital mechanics involved. As a result, we all got a whole lot smarter and really perfected rendezvous maneuvers, which Apollo now uses." Catching a target in orbit is a game played in a different ball park than chasing something down on Earth's essentially two-dimensional surface. Speed and motion in orbit do not conform to Earth-based habit, except at very close ranges. To catch something on the ground, one simply moves as quickly as possible in a straight line to the place where the object will be at the right time. As Gemini IV showed, that will not work in orbit. Adding speed also raises altitude, moving the spacecraft into a higher orbit than its target. The paradoxical result is that the faster moving spacecraft has actually slowed relative to the target, since its orbital period, which is a direct function of its distance from the center of gravity, has also increased. As the Gemini IV crew observed, the target seemed to gradually pull in front of and away from the spacecraft. The proper technique is for the spacecraft to reduce its speed, dropping to a lower and thus shorter orbit, which will allow it to gain on the target. At the correct moment, a burst of speed lifts the spacecraft to the target's orbit close enough to the target to eliminate virtually all relative motion between them. Now on station, the paradoxical effects vanish, and the spacecraft can approach the target directly. Gemini IV's problem was compounded by its limited fuel supply; the Spacecraft 4 tanks were only half the size of later models, and the fuel had to be conserved for the fail-safe maneuvers. When McDivitt and White broke off their futile chase, they had exhausted nearly half their load of propellants. White had been too busy helping his partner to give much thought to getting ready for EVA. Now that the rendezvous attempt was over, White put the zip gun together, while McDivitt read off a list of things for him to do. White pulled out the umbilical package and mounted suit connectors for the tether and the emergency oxygen chestpack. With 20 minutes still to go before cabin depressurization, the commander noticed that his copilot already looked tired and hot. McDivitt told the Kano tracking station that EVA would be postponed until the third revolution - he wanted White to rest. While they relaxed, the crewmen talked with Grissom, the Houston CapCom, about the synoptic view of the Gulf of Mexico and all of Florida, including the Cape and its launch complexes. After a 15-minute break, McDivitt picked up the list and White began checking suit hose locks and suit integrity. The flight planners had certainly not foreseen how much time getting ready for EVA would take, McDivitt thought. Over the Indian Ocean, White was ready for EVA at last - hoses hooked up, umbilical ready, gun in hand, and chestpack in place - and they again rested and chatted. Nearing Carnarvon, Australia, they began to depressurize the cabin. Then a mechanical problem arose - the door would not unlatch because a spring had failed to compress. After much yanking and poking around the hatch ratchet, the door suddenly cracked open. White found the hatch as hard to push up in zero g as it had been on the ground. There was the usual brief loss of communications between Hawaii and Guaymas, Mexico. While White was using the zip gun over the Pacific, Mission Control was unaware of how he was making out. After the voice circuit was restored, radio listeners had a chance to hear an American human satellite broadcast his views of the spectacle of Earth. White told McDivitt and the world how beautiful it all was, of the Pictures he was taking, and how well he was feeling - no vertigo or disorientation whatever. And when McDivitt had to tell him it was time to come back inside, Mission Control and the whole world heard him sigh, "It's the saddest moment of my life." While he was floating freely, White had paid no attention to the time; and, since they were on the internal spacecraft communications link, Flight Control could not break in on them. Finally, after 15 minutes 40 seconds, McDivitt broke off to ask the ground if they wanted anything. "Yes," Kraft chuckled, "Tell him to get back in." After he passed this on to White, McDivitt heard boots thumping atop the spacecraft. White came back to the hatch as Gemini IV was passing over the Atlantic, dismounted the camera and removed electrical connections, and handed all these items to McDivitt along with the gun. McDivitt then helped White get settled, pulling on his legs and guiding his feet into the footwells. White closed the hatch and reached for the handle to lock it. When it failed to catch, he knew it was going to be as hard to close as it had been to open. Pushing on the handle lifted White out of his seat, so McDivitt pulled on him to give him some leverage. Finally White felt a little torque in the handle and yelled for McDivitt to yank harder. The door was latched. White sat back, physically exhausted, sweat streaming into his eyes and fogging his faceplate. McDivitt also felt tired, so they rested before extending a radio antenna to find a ground-based voice and tell Earth all was well. Carnarvon answered them. The crew of Gemini IV had almost circled the globe in an unpressurized spacecraft. While White relaxed, McDivitt began powering down some of the spacecraft systems to save electrical power and control fuel, intending to drift for the next two and a half days. Seven and a half hours after liftoff, White went to sleep. He and McDivitt had intended to sleep alternate periods of four hours each, but this was hard to do. The constant crackle of radioed information and orders and the occasional automatic thruster firings kept them awake. Whoever was on duty frequently bumped the sleeper in this uncommonly small bedroom. Gemini IV was the first of the program's longer missions, and it imposed a set of new demands on ground control, which moved for the first time into a three-shift operation. Kraft acted as both Mission Director for the entire flight and Flight Director for the first shift. Eugene F. Kranz directed the second shift and John Hodge the third. Kraft's shift focused its efforts on helping McDivitt and White carry out the flight plan. The second shift concerned itself mainly with keeping track of systems performance and the use of such consumable stores as oxygen and fuel. Realtime flight planning was the special province of Hodge's shift. The basic framework of the flight plan was set before launch; but on the basis of what had already been achieved, how systems were working, and what stocks of fuel and other consumables remained, the third shift was ready by morning with specific instructions for the crew on tasks to be done or eliminated during the day ahead. Backing up the flight control teams were a number of systems experts who stood by in the staff support rooms of the new Mission Control Center. They included not only NASA specialists but also contractor people, some of whom were assigned full-time to Houston while missions were in progress. At their home plants, other teams maintained systems under simulated flight conditions to provide quick answers to flight problems. Technical monitors and principal investigators were also on hand in the Mission Control Center for the Gemini experiment program, now more methodically handled by a new Experiments Program Office under Robert Piland in the Engineering and Development Directorate. Gemini IV's 11 experiments made it the first American mission to bear some resemblance to the manned space laboratory that had long been a staple of space flight thought. Gemini IV was also the first mission to employ systematic methods to gather, evaluate, and publish information quickly, another demand imposed by longer flights and shorter intervals between missions. Willis Mitchell and Scott Simpkinson of GPO headed the 150-person Mission Evaluation Team that began work at liftoff and kept working through postflight inspection and mission evaluation. Gemini IV served as training ground for pilots, flight controllers, and evaluators alike, setting the style for later Gemini missions, as well as for future Apollo flights. Meanwhile, McDivitt and White drifted through space, watching systems, making observations, and doing experiments. A rigid constraint on fuel usage hampered most of these activities, although several of Gemini IV's 11 experiments were largely unaffected. Five dosimeters checked radiation in the spacecraft (experiment D-8), especially while Gemini IV was passing through the South Atlantic Anomaly (an intense pocket of the ionosphere), where radiation levels were considerably higher than in all other regions. In the Simple Navigation experiment (D-9), the pilots used a handheld sextant in an attempt to get celestial navigation readings, to judge sextant operation and navigational accuracy. McDivitt and White agreed that the sextant might be useful for Apollo. McDivitt and White had good fortune in the Synoptic Terrain (5-5) and Synoptic Weather (5-6) photography. The 70-millimeter Hasselblad camera worked well and, tourist-like, they tried to capture the view. They were especially smitten with the Nile River area - one saw Cairo, the other Alexandria - and White remarked that a landmark near a body of water was easier to spot. On one occasion, they snapped pictures from the Pacific Coast to Texas, showing good geological detail. They performed like professionals in getting pictures of weather phenomena. Unmanned Tiros weather satellites provide coverage from 640 kilometers, but Gemini IV gave the meteorologists a closer look, without a mosaic patchwork, at cellular cloud patterns, cloud layers in tropical disturbances, lines of cumulus clouds over the ocean, and thunderstorm areas. The crew used the bungee exerciser (M-3) more than had been planned, but White later said that his desire to do strenuous work dwindled during the flight; although, as McDivitt suggested, this might have been caused by lack of sleep. Both agreed that a systematic exercise program would be needed for long missions. Sensors attached to the pilots' bodies, in the Inflight Phonocardiogram experiment (M-4), gathered data on heartbeat rates, especially during liftoff, EVA, and reentry. As might be expected, their heartbeats were essentially normal except during these periods. The bone demineralization experiment (M-6) did show a greater mass loss in the small finger and heel than that experienced by Earthbound, bedrested patients. One engineering experiment - Electrostatic Charge (MSC-1) - gave higher readings than expected. Investigation later determined that thruster and water boiler operation produced some moisture, resulting in a high electrical charge, which dissipated very quickly. Concerns that docking in space might generate a harmful jolt were laid to rest. The Proton-Electron Spectrometer (MSC-2) and Tri-Axis Magnetometer (MSC-3), complementary radiation studies, provided useful data about Earth's radiation environment and the magnitude and direction of local geomagnetic fields. Photographing the red-blue Earth limb was the final engineering experiment (MSC-10), designed to help train Apollo astronauts in making navigational fixes. After 48 revolutions, covering 75 hours of flight, the spacecraft computer was updated during a stateside pass. Told to turn the computer off, McDivitt flipped the switch and discovered that he could not. On the ground, efforts to solve the problem began at once. For the next few revolutions, the crew received instructions for trying different switch positions, but the computer finally quit entirely. Now they would have to resort to a rolling Mercury-type reentry, rather than the lifting bank angle the computer was supposed to help them achieve. In revolution 62, at 97 hours 28 minutes, they fired their maneuvering thrusters in the proper retroattitude for 2 minutes 41 seconds. Afterward they jettisoned the equipment adapter. Bang! bang! bang! bang! went the retrorockets. White watched the brown, dusty Texas plains pass in review and then released the retroadapter. 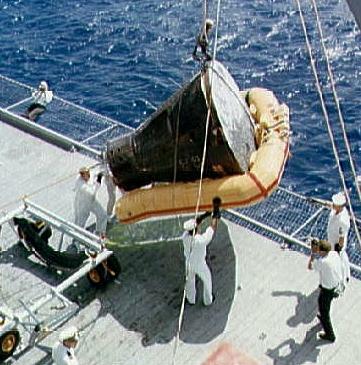 Gemini IV was returning to Earth. At 120,000 meters, McDivitt started the rolling reentry. As the spacecraft rotated, the crew saw the adapter, trailing them, turn into an orange mushroom as it burned. Without the computer, McDivitt and White suspected, they would land short of the planned Atlantic landing point. The spacecraft was getting some lift, but they were sure it would not be enough. McDivitt and White welcomed the increasing g-rates. White noticed no dimming of vision and no shortness of breath. They talked, watched their instruments, and enjoyed the scenery. At 27,000 meters, McDivitt slowed the roll rate and stopped it completely at 12,000 meters. Shortly, he punched out the drogue parachute. When it deployed, the spacecraft gyrated instead of stabilizing. At 3,230 meters, the main parachute deployed and unfurled with a comforting shock, and then they braced themselves for the 1,500-meter, two-point suspension mark. When the spacecraft assumed its new position, the crew lurched forward, then backward, but neither knocked their helmets against anything. The splashdown - at 97 hours 56 minutes 12 seconds after launch - was rough, slamming them against the water. But they were down and safe, so far. Gemini IV missed its mark by 80 kilometers; but several of the recovery ships had begun moving toward its landing site, and one helicopter crew watched the spacecraft descend to the ocean. Within a few minutes, swimmers jumped into the water and attached a flotation collar. Then the pilots were hoisted into the helicopter. Fifty-seven minutes after touchdown, the crew stepped onto a triumphal red carpet on the deck of the aircraft carrier Wasp to be greeted by the ship's crew. During the helicopter ride, an MSC physician reported that the crew seemed to be in good shape. Nevertheless, everyone wondered about their physical condition after being weightless so long. A NASA information specialist, who had seen Cooper stagger after his Mercury flight, was surprised to see White do a jig-step. A colleague commented, "The air of tension immediately dissipated." Berry and his medical team met the crew aboard the Wasp. Medical examinations over the next 66 hours revealed no major problems. In fact, on the day after the landing, on his way to the ship's medical ward, White noticed some Marines and midshipmen having a tug-of-war. He joined the midshipmen for 15 minutes. Although his team lost, White certainly appeared strong and healthy. Later McDivitt and White inscribed a picture of themselves walking across the red carpet, "The day the straw men fell down." Berry agreed, as he found his patients fatigued but showing no sign of faintness. Although the loss of bone mass in the heel and little finger was not surprising, physicians were startled to find a loss in the volume of plasma - circulating blood. Both lost weight, as have all American astronauts - McDivitt, two kilograms (four and a half pounds); White four kilograms (eight and a half pounds). But they paved the way for an even longer mission. Gemini IV roused great excitement, with all its daily activities heralded in newspapers around the world. Its deeds shunted aside dark clouds that loomed on 7 June (the day that McDivitt and White returned from space), when the U.S. Military Command in South Vietnam announced that its troops would fight alongside Vietnamese forces. President Johnson came to Houston to congratulate them; a million Chicagoans showered them with ticker tape; and Administrator Webb sent them, at the request of the President, to the Paris International Air Show, where they met Cosmonaut Yuri Gagarin, the first space traveler. Family: Manned spaceflight. People: McDivitt, White. Country: USA. Spacecraft: Gemini. Launch Sites: Cape Canaveral. Agency: NASA Houston. The Titan 2 ICBM was used for launch of the Gemini manned spacecraft. 1963 November 16 - . LV Family: Titan. Launch Vehicle: Titan II. Rendezvous evaluation experiment for the Gemini-Titan 4 mission. - . Nation: USA. Flight: Gemini 4. Spacecraft: Gemini. Flight Crew Support Division reported an agreement with Flight Operations Division on a flight profile and rendezvous evaluation experiment for the Gemini-Titan 4 mission. Objective of the experiment was to stimulate normal Agena/Gemini rendezvous and to repeat part of the maneuver using loss of signal/manual technique. Basically, the mission would use circular phasing and catch-up orbit as proposed by the Flight Crew Support Division. Exact fuel requirements and ground tracking requirement were under study by Flight Operations Division. 1964 January 13 - . 1964 March 6 - . LV Family: Titan. Launch Vehicle: Titan II. Gemini launch vehicle 4 in assembly - . Nation: USA. Flight: Gemini 4. Spacecraft: Gemini. Martin-Baltimore received the propellant tanks for Gemini launch vehicle 4 from Martin-Denver, which had begun fabricating them in November 1963. Tank splicing was completed July 21. Aerojet-General delivered the stage II flight engine June 26, the stage I engine July 28. Engine installation was completed September 4. Final horizontal tests were completed and reviewed October 26, with Martin authorized to erect the vehicle in the vertical test facility. 1964 July 27 - . LV Family: Titan. Launch Vehicle: Titan II. McDivitt and White II named for the Gemini-Titan 4 mission. - . Nation: USA. Flight: Gemini 4. Spacecraft: Gemini. New Gemini flight schedule resulting from the lightning strike and hurricane conditions. - . Nation: USA. Flight: Gemini 3, Gemini 4. Spacecraft: Gemini. Gemini Program Manager Charles W. Mathews presented the Gemini Management Panel with the new flight schedule resulting from the lightning strike and hurricane conditions. The schedule was as follows: Gemini-Titan (GT) 2, November 17; GT-3, January 30, 1965; and GT-4, April 12. For GT-4 through GT-7, three-month launch intervals were planned; for the remainder of the program, these intervals would be reduced to two and one half months. 1964 October 17 - . LV Family: Titan. Launch Vehicle: Titan II. Gemini-Titan (GT) 3 crew completed egress practice - . Nation: USA. Flight: Gemini 3, Gemini 4. Spacecraft: Gemini, Gemini Parachute. Flight Crew Support Division reported that the Gemini-Titan (GT) 3 primary crew had completed egress practice in boilerplate No. 201 in the Ellington Air Force Base flotation tank. The backup GT-4 crew was scheduled for such training on October 23. Full-scale egress and recovery training for both the GT-3 and the GT-4 crews was scheduled to begin about January 15, when parachute refresher courses would also be scheduled. 1964 October 28 - . LV Family: Titan. Launch Vehicle: Titan II. Gemini launch vehicle 4 was erected in the vertical test facility at Martin-Baltimore. - . Nation: USA. Flight: Gemini 4. Spacecraft: Gemini. Power was applied to the vehicle for the first time on November 4. Subsystems Functional Verification Tests were completed November 19..
1964 November 25 - . LV Family: Titan. Launch Vehicle: Titan II. The Combined Systems Acceptance Test of Gemini launch vehicle (GLV) 4 was conducted. - . Nation: USA. Flight: Gemini 4. Spacecraft: Gemini. The vehicle acceptance team inspected the vehicle and reviewed all test and manufacturing data December 11-13 and authorized Martin to remove GLV-4 from the vertical test cell. During the next three months, while awaiting shipment to Cape Kennedy, GLV-4 had 27 engineering changes installed. Final integrity checks, weighing, and balancing were completed March 8, 1965. 1964 November 30 - . LV Family: Titan. Launch Vehicle: Titan II. McDivitt and White began crew training - . Nation: USA. Flight: Gemini 4. Spacecraft: Gemini. Astronauts James McDivitt and Edward White, command pilot and pilot for the Gemini-Titan 4 mission, began crew training on Gemini mission simulator No. 2 in Houston. The initial week of training was devoted to familiarizing the crew with the interior of the spacecraft. 1964 December 15 - . LV Family: Titan. Launch Vehicle: Titan II. The Gemini Phase II centrifuge training program was completed. - . Nation: USA. Flight: Gemini 3, Gemini 4. Spacecraft: Gemini. Phase II provided refresher training for Gemini-Titan 3 and 4 flight crews, who made their runs clad in pressure suits. For astronauts not yet officially assigned to a mission the program provided familiarization training under shirt-sleeve conditions. Phase II had begun early in November. 1965 January 5 - . LV Family: Titan. Launch Vehicle: Titan II. Revised Gemini-Titan (GT) 3 flight plan to cover the possibility of retrorocket failure. - . Nation: USA. Flight: Gemini 3, Gemini 4. Spacecraft: Gemini. NASA Headquarters provided Flight Operations Division with preliminary data for revising the Gemini-Titan (GT) 3 flight plan to cover the possibility of retrorocket failure. The problem was to ensure the safe reentry of the astronauts even should it become impossible to fire the retrorockets effectively. The Headquarters proposal incorporated three orbit attitude and maneuver system maneuvers to establish a fail-safe orbit from which the spacecraft would reenter the atmosphere whether the retrorockets fired or not. This proposal, as refined by Mission Planning and Analysis Division, became part of the flight plans for GT-3 and GT-4. 1965 January 12 - . LV Family: Titan. Launch Vehicle: Titan II. Flight tests of the zero-gravity mock-up of the Gemini spacecraft began. - . Nation: USA. Flight: Gemini 4. Spacecraft: Gemini. The mock-up was installed in a KC-135 aircraft to provide astronauts with the opportunity to practice extravehicular activities under weightless conditions. The Gemini-Titan (GT) 3 flight crew participated in the opening exercises, which were duplicated the next day by the GT-4 flight crew. 1965 January 31 - . McDonnell completed major manufacturing activity for Gemini spacecraft No. 4. - . Nation: USA. Flight: Gemini 4. Spacecraft: Gemini. McDonnell completed major manufacturing activity, module tests, and equipment installation for Gemini spacecraft No. 4. Phase I modular testing had begun November 30, 1964. Mating of the spacecraft reentry and adapter assemblies was completed February 23. Systems Assurance Tests began February 24. 1965 February 12 - . LV Family: Titan. Launch Vehicle: Titan II. 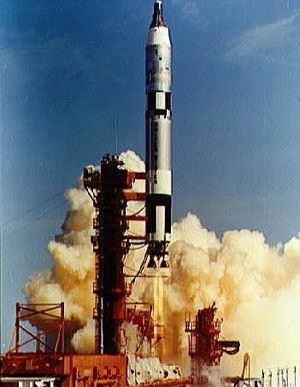 Gemini-Titan (GT) 3 mission might be flown between March 22 and 25, 1965. - . Nation: USA. Related Persons: Kraft. Flight: Gemini 4. Spacecraft: Gemini. Director of Flight Operations Christopher C. Kraft, Jr., told the Manned Spacecraft Center senior staff that the Gemini-Titan (GT) 3 mission might be flown between March 22 and 25, although it was officially scheduled for the second quarter of 1965. In addition, the Houston control center was being considered for use in the GT-4 mission. McDonnell completed Systems Assurance Tests of Gemini spacecraft No. 4. - . Nation: USA. Flight: Gemini 4. Spacecraft: Gemini. The Simulated Flight Test was conducted February 27-March 8. Preparations for altitude chamber testing lasted until March 19..
1965 March 10 - . LV Family: Titan. Launch Vehicle: Titan II. Roll-out inspection of Gemini launch vehicle (GLV) 4 - . Nation: USA. Flight: Gemini 4. Spacecraft: Gemini. Air Force Space Systems Division formally accepted delivery of the vehicle March 21, and preparations to ship it to Cape Kennedy began at once. GLV-4 stage I arrived at the Cape March 22, followed the next day by stage II..
Altitude Chamber Tests of Gemini spacecraft No. 4, involving five simulated flights, began at McDonnell. - . Nation: USA. Flight: Gemini 4. Spacecraft: Gemini. Altitude Chamber Tests of Gemini spacecraft No. 4, involving five simulated flights, began at McDonnell. The first run was unmanned. In the second run, the prime crew flew a simulated mission, but the chamber was not evacuated. The third run repeated the second, with the backup crew replacing the prime crew. The fourth run put the prime crew through a flight at simulated altitude, and the fifth did the same for the backup crew. Altitude chamber testing ended March 25, and the spacecraft was prepared for shipment to Cape Kennedy. 1965 March 29 - . LV Family: Titan. Launch Vehicle: Titan II. 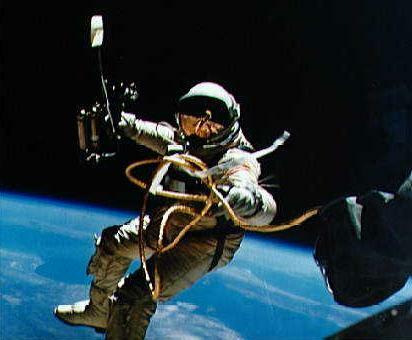 Full EVA considered for Gemini 4. - . Nation: USA. Related Persons: Gilruth, Low, George, Mueller, Seamans. Flight: Gemini 4. Spacecraft Bus: Gemini space suits. Spacecraft: G4C, Gemini. 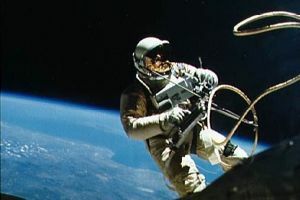 The possibility of doing more than the previously planned stand-up form of extravehicular activity (EVA) was introduced at an informal meeting in the office of Director Robert R. Gilruth at Manned Spacecraft Center (MSC). Present at the meeting, in addition to Gilruth and Deputy Director George M. Low, were Richard S. Johnston of Crew Systems Division (CSD) and Warren J. North of Flight Crew Operations Division. Johnston presented a mock-up of an EVA chestpack, as well as a prototype hand-held maneuvering unit. North expressed his division's confidence that an umbilical EVA could be successfully achieved on the Gemini-Titan 4 mission. Receiving a go-ahead from Gilruth, CSD briefed George E. Mueller, Associate Administrator for Mannned Space Flight, on April 3 in Washington. He, in turn, briefed the Headquarters Directorates. The relevant MSC divisions were given tentative approval to continue the preparations and training required for the operation. Associate Administrator of NASA, Robert C. Seamans, Jr., visited MSC for further briefing on May 14. The enthusiasm he carried back to Washington regarding flight-readiness soon prompted final Headquarters approval. Gemini launch vehicle 4 was erected at complex 19. - . Nation: USA. Flight: Gemini 4. Spacecraft: Gemini. After the vehicle had been inspected, umbilicals were connected March 31 and power applied April 2. Subsystems Functional Verification Tests began immediately and were completed April 15. The Prespacecraft Mate Combined Systems Test was conducted the next day (April 16). 1965 April 4 - . McDonnell delivered Gemini spacecraft No. 4 to Cape Kennedy. - . Nation: USA. Flight: Gemini 4. Spacecraft: Gemini. Receiving inspection was completed April 6. Other industrial area activities, including pyrotechnic buildup, temporary installation of seats, and final preparation for pad testing were completed April 14. The spacecraft was then moved to complex 19..
1965 April 14 - . Gemini spacecraft No. 4 was hoisted into position atop the launch vehicle. - . Nation: USA. Flight: Gemini 4. Spacecraft: Gemini. Cabling for test was completed April 19, and premate systems tests began. For the first time, Mission Control Center, Houston, supported Kennedy Space Center pad operations. Systems testing ended April 21. The Prespacecraft Mate Simulated Flight Test was conducted April 22-23. 1965 April 23 - . LV Family: Titan. Launch Vehicle: Titan II. Gemini launch vehicle (GLV) 4 and spacecraft No. 4 were mechanically mated at complex 19. - . Nation: USA. Flight: Gemini 4. Spacecraft: Gemini. The Electrical Interface Integrated Validation and Joint Guidance and Control Test were completed April 26-29. These had been separate tests for earlier vehicles, but from Gemini-Titan 4 on, the tests were combined and performed as one. The spacecraft/GLV Joint Combined Systems Test followed on April 30. The Flight Configuration Mode Test finished systems testing May 7. 1965 May 13 - . LV Family: Titan. Launch Vehicle: Titan II. 1965 May 15 - . Qualification of the G4C extravehicular suit was completed. - . Nation: USA. Flight: Gemini 4. Spacecraft Bus: Gemini space suits. Spacecraft: G4C, Gemini. This suit was basically the same as the G3C suit except for modifications which included a redundant zipper closure, two over-visors for visual and physical protection, automatic locking ventilation settings, and a heavier cover layer incorporating thermal and micrometeoroid protection. Six G4C suits would be at the launch site for the Gemini 4 flight crews by the end of May. 1965 May 19 - . All extravehicular equipment planned for the Gemini 4 mission qualified. - . Nation: USA. Flight: Gemini 4. Spacecraft Bus: Gemini space suits. Spacecraft: G4C, Gemini. All extravehicular equipment planned for the Gemini 4 mission, including the ventilation control module, the extravehicular umbilical assembly, and the hand-held maneuvering unit, had been qualified. The flight hardware was at the launch site ready for flight at the end of May. Soyuz-VI program started.. - . Nation: Russia. Related Persons: Kozlov. Flight: Gemini 4, Soyuz VI Flight 1. Spacecraft Bus: Soyuz. Spacecraft: Soyuz VI, Gemini, MOL. Central Committee of the Communist Party and Council of Soviet Ministers Decree 'On expansion of military space research and on 7K-VI Zvezda' was issued. 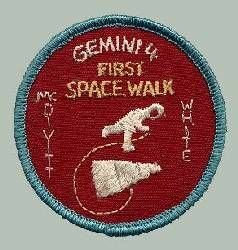 In June 1965 Gemini 4 began the first American experiments in military space. At the same time the large military Manned Orbital Laboratory space station was on the verge of being given its final go-ahead. These events caused a bit of a panic among the Soviet military, where the Soyuz-R and Almaz projects were in the very earliest stages of design and would not fly until 1968 at the earliest. VPK head Leonid Smirnov ordered that urgent measures be taken to test manned military techniques in orbit at the earliest possible date. Modifications were to be made to the Voskhod and Soyuz 7K-OK spacecraft to assess the military utility of manned visual and photographic reconnaissance; of inspection of enemy satellites from orbit; attacking enemy spacecraft; and obtaining early warning of nuclear attack. The decree instructed Kozlov to fly by 1967 a military research variant of the Soyuz 7K-OK 11F615. 1965 August 31 - . Gemini Program Office reported that during the missions of Gemini 4 and 5, skin-tracking procedures had been successfully developed. - . Nation: USA. Flight: Gemini 4. Spacecraft: Gemini, Gemini Radar. Gemini Program Office reported that during the missions of Gemini 4 and 5, skin-tracking procedures had been successfully developed. On these missions, the C-band radars were able to track the spacecraft in both the beacon and skin-track mode. It was, therfore, possible to obtain tracking data when the spacecraft was powered down and had no tracking beacons operating. As a result, the skin-tracking procedures were integrated into the network support for all remaining Gemini missions.